For all southern Indiana has to offer, to me there is nothing that compares to our rich heritage found in life on a farm. So when it came time to transition from the corporate world of accounting into something “new and different”, I began the search on many fronts with one being enrolling in Purdue’s Master Gardener class. Amanda Mosiman and the entire Purdue team of guest instructors provided me a glimpse into the world of horticulture and I have never turned back. First Time Flower Farmer at 50? Because flowers bring out the best emotions in all of us! Who can look at a freshly harvested handful of flowers and not smile and sigh just a little. So as someone who truly finds fulfillment in providing one of life’s most basic desires – happiness – the challenge of becoming a flower farmer became a real business proposition for me. I never knew how challenging and rewarding it would be to be an entrepreneur until I decided to be one! And in the entrepreneurial world, inspiration serves as the cornerstone. Similar to many, I find inspiration from those I surround myself with as well as those I encounter through community involvement. But I also have another source, and that is inspiration from two pieces of historical significance that have been part of my daily life for the last 20 years. The originally constructed 1890 Darnell School still stands across from my farm. Amazing is one of many words that come to mind daily as I pass it and wonder what life was like through the years it served our children. Additionally, I am blessed to have a one room log cabin as my floral workshop . Rock solid are its walls after being weathered for these many years. So when I’m my most challenged and seeking inspiration, all I have to do is turn 360 degrees anywhere on the Farm to see not only these historical treasures but also three families of farmers tending the land around me while looking for ways to balance the needs of the environment with the need to feed the world. Constructed 1890, two room design with metal roof. Picture taken March 2018 of west facing front of school. I hope that you will allow me to share a piece of me and my one-acre farm with you this year, even just one bloom will bring with it not just my story but an experience that you can be a part of. Join me, share in the love of flowers! Situated at the corner of Darnell School and Ford Road my little one acre farm stands out in contrast to its many neighbors. Whether it is in the height of summer when color bursts against the greenery of the adjacent farm fields; or in the fall when my soil has been tilled, cover crop sown and the green carpet pokes above the fallen leaves and harvested farm lands there is no doubt a small market farm is present. 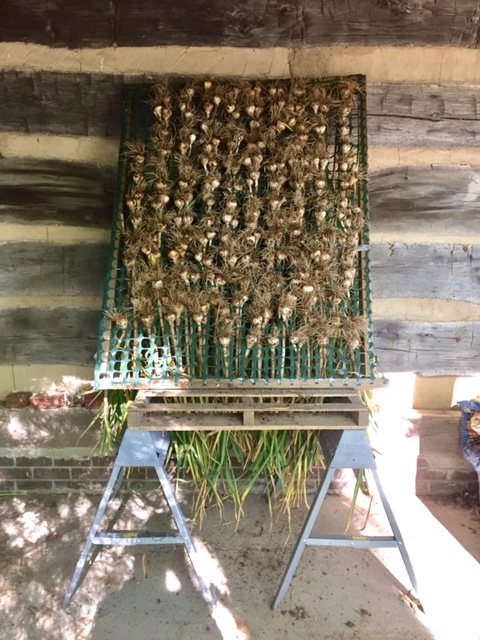 The hard neck garlic crop drying under log cabin overhang. The prior owner relocated a log cabin to this property, which he indicated was from the early 1800s. Added was a concrete floor, brick foundation and shingle roof. Left in its original state are the hand hewed log walls, rock solid for the most part. It is an amazing building, staying cool in the summer and warm in the winter compared to my other block and metal buildings. I am thankful to have this historical treasure to call my workshop where bouquets are crafted and prepared for delivery to you. And like many small farms that are also the farmer's home site, many of the tools, equipment and buildings share dual purposes be it my father's 1965 Ford tractor pulling a fallen tree to the brush pile or his favorite finish mower attached to the back helping me keep my access ways and the road side trimmed to prevent the spread of weed seeds. I currently share my home with my boyfriend, Mark Head, my three outdoor hard working farm cats and his two indoor rather spoiled ones. I am thankful for all of them! I have lived for 20 years at these cross roads where my 4 acre home site has evolved in shape and color. It is my hope to live the next 20 years continuing to cultivate the land and share its bounty with my surrounding community. and for the most part they are a hard working crew! Tuesday arrived on the Farm on a Tuesday evening in 2005. She is pretty much semi-retired, preferring to lounge on the pool deck in the summer and curl up in her heated pet condo during the cold winter months. Gray Kitty gets page banner placement as he is the hardest working mouser you have ever met. He enjoys spending time with me in the flowers as well as napping in the catnip patch. And then there is OJ, who appeared during 2017 looking like the most beat up ferrel kitty you have ever seen. Tuesday became infatuated with him, so we let him stay. Now he proudly takes his place on the second floor of the heated cat condo. We are still working on letting me pet him, but we will get there! Sign Up NOW to receive Farm updates on what’s in bloom, Field to Vase Hands-On Class and On-Farm Events!